This is a strange album. Kensington Market, named after the famed market in Toronto, decided to name their debut record after a street nowhere near the Market they derive their name from. Avenue Road is also the strangest named street in Toronto. Is it an avenue or a road? Make up your mind, Toronto! The album is a strange mixture of British Invasion-styled pop, rock and roll, medieval faire-fare, psychedelia, and schmaltz. It’s almost as if Graham Nash took a hit of acid, visited a medieval faire, started dancing around until he found a harpsichord1. This album seems to be an endeavour to create a Canadian reaction to the British Invasion, but there’s so much missing. There’s no soul, there’s no grit, there’s no sense of style. The album also is a child of its time. 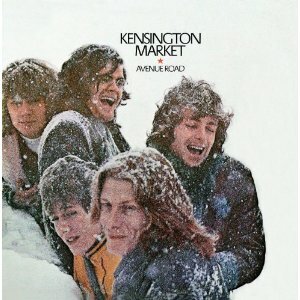 While other ’60s bands, like The Beatles, were able to stand the test of time, listening to Kensington Market is almost a chore due to the dated and overly stylized production. “Beatrice” aaaah! This song isn’t great, but it’s worth a mention, because it’s silly and a bit ridiculous. It could almost be a song written by Charlie on It’s Always Sunny In Philadelphia. Sadly “Phoebe” is not a song about the character from Friends. Also sad is that it’s just a plainly boring song.